The Mirage Camera is expected to be available beginning in the second quarter this year. 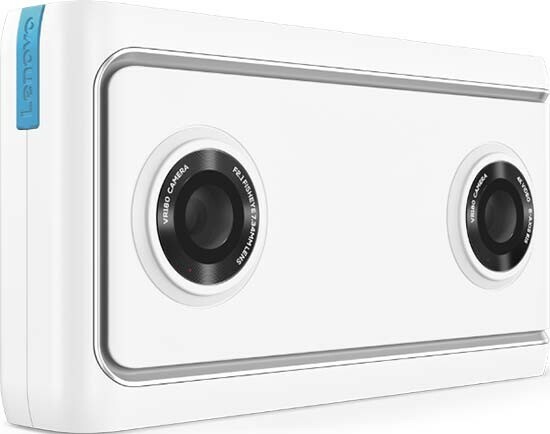 Today, Lenovo™ announced, in partnership with Google®, the Lenovo Mirage Camera with Daydream, a powerful new tool that lets you capture and relive memories like you’re really in the moment. The Lenovo Mirage Camera is a VR camera that simplifies creating virtual reality content with easy video or image capture and wireless upload to your personal Google Photos™ and YouTube™ account. VR180 eliminates the need for specialized virtual reality videography skills and professional camera gear to shoot immersive 3D VR videos and photos. Everyday users and digital storytellers can now create, produce and share immersive content without expending extra effort or equipment—just point, shoot, relive and share. Launching the Lenovo Mirage Solo and Lenovo Mirage Camera with Daydream together reaffirms our commitment to designing products that are different for the sake of being better. Together, the Lenovo Mirage Camera and Lenovo Mirage Solo with Daydream complement each other for users interested in immersive VR but who want affordable prices, high-quality content and simple set-up. A compact point-and-shoot camera, the Lenovo Mirage Camera, slips right into your pocket and supports YouTube’s new VR180 video format. Its dual 13MP fisheye cameras achieve depth in image and video by capturing the same images at slightly different angles to form a 3D effect, in which near objects look near, while far objects appear far. The two lenses also offer a 180 x 180-degree field of view to let you see more. Finally, we built the Lenovo Mirage Camera at a price for mainstream consumers; democratizing VR by proving you don’t need expensive equipment or computers to make VR. VR180 videos act exactly like standard 2D videos in YouTube, Google Photos and companion apps—meaning you can watch the same ultra-high-resolution 4K video on your phone, tablet or PC—all without needing a headset. But owning a VR headset such as a Google Cardboard™ or the Lenovo Mirage Solo with Daydream adds the immersion element to your viewing experience and encourages you to watch again and again. And like 2D videos, VR180 videos can also be edited with familiar and popular video editing software. You can work with Adobe® Premiere® Pro to edit VR180 videos in post-production without having to learn and adopt different formats or using specialized hardware to stitch footage. 1 Actual available capacity of user storage is less because the operating system, and other software which utilize part of this capacity. 2 Actual results will vary, and depend on numerous factors including product configuration and usage, operating conditions, wireless functionality and other factors. The maximum capacity of the battery will naturally decrease with time and usage.